Four years after Tahrir Square, there is still too much control and abuse, writes Chalaine Chang. 24 January 2015, was the 4th anniversary of the 2011 Egyptian uprising. A few hours before, a woman was killed. Shaimaa al-Sabbagh, 31, an activist and member of the Popular Socialist Alliance Party, had come from Alexandria for a small demonstration with her colleagues. President Abdel Fattah al-Sisi had cancelled the fourth anniversary of the revolution. This was because of the week of mourning for Saudi Arabia’s King Abdullah’s death. No-one could go in Tahrir Square, as usual, because of the barbed wire and barriers. These barriers have been there since the military takeover, except for a few demonstrations to support the government. 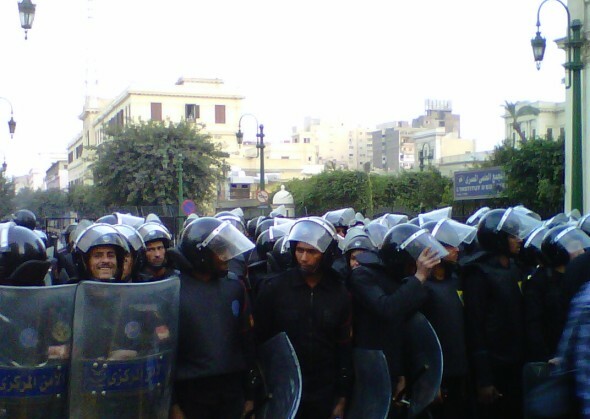 In the afternoon, there were about 30 activists in Talaat Harb square – near the centre of the 2011 protests. The group was protesting peacefully. They wanted to move towards Tahrir Square to leave flowers in memory of demonstrators who were killed in the protests four years before. But with no warning, riot police in masks began shooting teargas and bird-shot at the small procession. Al-Sabbagh was hit in her neck and back and fell to her knees in the middle of the crowded street as a friend tried to support her. The bird-shot killed her because it was shot so close to her. It went into her lungs and heart and caused a lot of bleeding. People sent videos of her death across Egypt and other countries – a symbol of the uncontrolled brutality in Egypt again. The Ministry of Interior (MOI) said they were not responsible. He said someone from within the crowd shot at Shaimaa. He said the police do not have that type of shot. At a press conference, Gamal el Moukhtar, a senior official in the ministry, said that the images of Shaimaa’s death were not important. He said a group from the Muslim Brotherhood creates photos and videos that tell people the police assault protesters. The MOI tries to say they are not responsible, but Amnesty International and Human Rights Watch said that photographic and video evidence show that Sabbagh was killed by bird-shot fired by a member of the Egyptian security forces. Everyone knows that 25 January was when the 18 days of demonstrations started – to end the control of Hosni Mubarak, who was Egypt’s dictator. The demonstrations were planned to be at the same time as National Police Day, after the terrible police brutality and to end the protection of Mubarak’s security forces. People also wanted ‘bread, freedom, and social justice’. But, four years later, another 25 people have died, including two police conscripts and a 10-year-old boy, in the fighting between security forces and protesters. And they still have the same problems. Unemployment rates are not changing, there is more control of freedoms of meeting and expression, and the security forces are still using violence against the people. Terrorism is still a problem in Egypt. But the government uses terrorism to justify all the control they have over the people. After the military takeover in July 2013, they have said the Muslim Brotherhood is responsible for all the terrorism, instability and violence, and for any general problems of the country. In December 2013, the government said the Muslim Brotherhood was not allowed. And they have tried to stop the group completely, to make the country more stable and secure. But so far, all they have done is stop all forms of opposition and stop people meeting and talking, which is against human rights. Human rights groups say that no-one is allowed to oppose the state; human rights are the worst they have ever been in Egypt’s modern history. Sisi accepts opposition less than previous presidents Mohamed Morsi and Hosni Mubarak. Wiki Thawra (a database with information about arrests) says that at least 41,000 people were arrested between August 2013 and May 2014. Prisons are full of activists and people the government say are associated with the Muslim Brotherhood. There are now not so many big protests – after the anti-protest law in November 2013. But there are some small protests, mostly outside central Cairo, particularly in Islamist areas – not covered in international news. There is sometimes fighting between protesters and the police, and some deaths that are often not reported. But Shaimaa’s death is very important because she was a leftist activist, she was unarmed and she had no links to the Muslim Brotherhood. She was an activist of the revolution – the same revolution that the military regime say they supported. Other demonstrators are shot and it is easy for the police to say that they were terrorists or that they were killed by people linked to the Muslim Brotherhood. This happened one day before Shaimaa’s death, when Sondos Reda, a 17-year-old girl, was shot and killed near fighting between security forces and protesters at a pro-Muslim Brotherhood demonstration in Alexandria. Shaimaa’s death shows how much force the state can use against the people, saying it is fighting against terrorism. In Egypt, many people were shocked, but many were not surprised. The people were shocked but the police do not seem to want to change. Al-Sisi said he was sad about her death and said he saw her as a ‘daughter’. But he also said they should not use one person’s mistake to change a whole institution [the police force]. Last Wednesday, an Egyptian court put 230 activists including Ahmed Douma (one of the leading activists of the 2011 uprising) in prison for life for fighting in protests. On Monday, 183 Muslim Brotherhood supporters got death sentences for killing 15 police officers in 2013. But in November 2014, a court said Mubarak was not guilty of killing protesters. And, in other cases, almost all police officers have been found not guilty of killing protesters. The government will probably not stop the repression. Four years after Tahrir Square there is very little space to protest, and also a feeling that they are tired and they have lost. Activists were at the front of the uprising. Now they know that many of their friends and colleagues have been silenced, shot at, or put in prison. The country is divided politically. This helps the government. The activists and Islamists do not trust each other, so the opposition is divided and weak. They all came together in 2011, but now there is fighting between the different groups. This makes it less possible for building resistance in the country. Additional reporting by Alessandro Accorsi. NOW READ THE ORIGINAL: http://newint.org/features/web-exclusive/2015/02/05/egypt-repression/ (This article has been simplified so the words, text structure and quotes may have been changed). This page was last edited on 7 February 2015, at 14:11. This page has been accessed 1,369 times.